The Smart Automation Team is again presenting at the Schneider Electric Innovation Summit in Sydney yesterday and today. 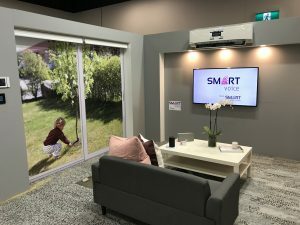 We are there to showcase our Smart Voice integration with the Schneider products. On the Schneider stand we have our Amazon Alexa voice speaker using Smart Voice to talk to the show Wiser 2 system, controlling lights, AV etc. The boys at Smart Automation have all worked incredibly hard to make the cool tech happen for the conference.